Fable: The Journey threatens at every turn to be a great game. It’s simple and relatively straightforward in a lot of ways, but setting the story in the rich world of Albion that Lionhead Studios colored in its previous Fable outings proves to be the lynchpin that holds everything together. The story, the writing, the performances, the presentation as a whole hits a peak within Lionhead’s catalog. It’s just too bad that the Kinect technology doesn’t measure up. It’s great fun when it works, but it only truly works about 50-percent of the time, usually flipping between the two states in the space of a single play session. And so, although Fable: The Journey constantly threatens greatness, we’ll have to settle with “Good, but…” until the Kinect 2 can finally (hopefully) deliver on Microsoft’s ambitious promise of turning your body into a controller. This latest adventure through Albion shares the same sort of high-concept “nobody-to-hero” arc that characterizes the series’ previous games. Our young protagonist is Gabriel, an undisciplined, accident-prone teenager who bumbles his way into being separated from his caretaker. He sets out on another path in the hopes of linking back up with his people, but along the way he runs into the seer Theresa, who is herself on the run from a malevolent force. The two make their escape thanks to Gabriel’s trusted horse Seren, but the animal is mortally wounded during their flight. The only cure, Theresa tells Gabriel, involves seeking out a pair of magical gauntlets, though there’s a price attached to the artifacts that must be paid. Desperate to save his friend, Gabriel agrees and sets out to retrieve the gauntlets. Once worn, they bind themselves to his wrists, granting him magical powers and setting him on the unwilling path of a hero. Gabriel, of course, transforms over the course of the story, eventually coming to accept his role as he, Theresa, and Seren travel a difficult road to save Albion. That’s the basic setup, though Seren is much more important than that description might make it seem. The horse is a constant, mute companion during Gabriel’s adventures, a source of transportation that depends on the young boy — and through him, the player — to survive and to keep the journey moving forward. The relationship that Fable: The Journey works to build between player and virtual horse is not too far off from the dogs of previous games, though your Journey companion is much more of an interactive centerpiece as your care and handling of the horse inform many of your experience gains. I’ll admit that some of this feels very contrived. During your frequent stops to camp, you’ll spend some time caring for the horse by healing its wounds and, in more elaborate campground settings, brushing it, giving it water, and feeding it apples. The fact that you’re always brushing off the same mud textures, dumping water into the same stone trough, and pulling an endless supply of red and green apples off the same tree branch very effectively breaks the illusion. The saving grace, then, is that the writing and performances are strong enough to help you overlook these shortcoming. not to mention the surprisingly lifelike horse animations. It’s a win for presentation over mechanics here; not exactly the ideal state for a game to exist in, but once you accept the idea that you’re playing more of an interactive story than a proper video game — and the mechanics at large help in that regard — it becomes an easier issue to overlook. 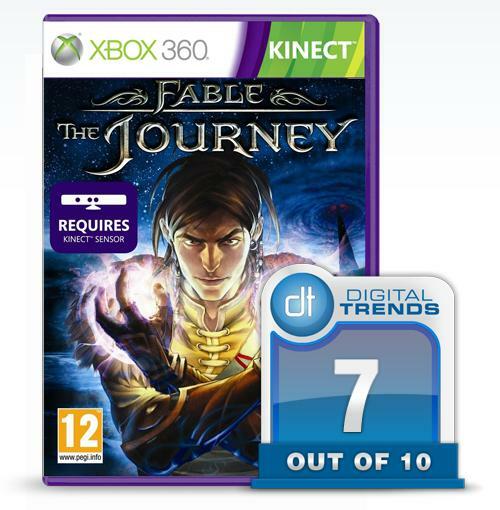 Fable: The Journey is a Kinect game to the core. You can use your controller to open up the Xbox 360 guide menu, but none of the buttons or analog sticks do anything inside the game, not even in menus. This is a 100-percent motion-controlled experience. It’s also one that, unlike most other Kinect titles, is designed for seated play. This alone is a huge boost to the experience, even if the Kinect technology frequently falls short. Which it does. 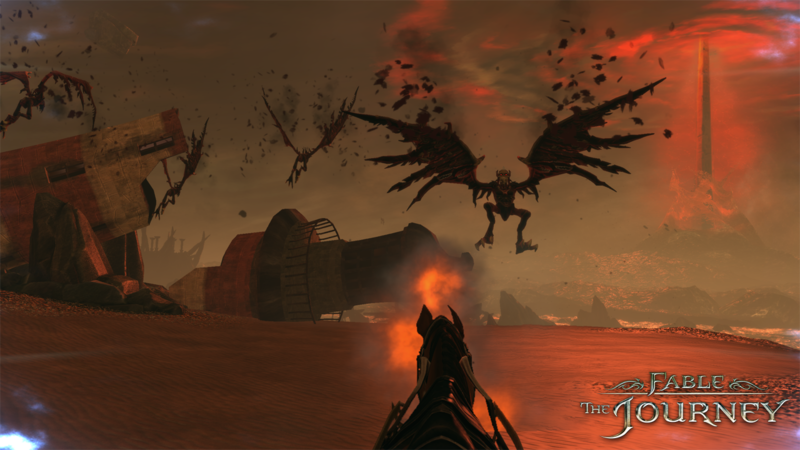 There are two main threads of gameplay: riding in your horse-drawn carriage and doing battle with magic. Sometimes you’ll cast spells from your carriage, at which point you no longer need to worry about driving. That’s the basic breakdown of what you’ll be doing, with the third, relatively minor activity of caring for Seren at campsites trailing behind the other two. The motion controls are straightforward and intuitive across the board. For driving the carriage, pulling one hand back and pushing the other hand forward allows you to steer left and right. Flicking both hands up and then down flicks the in-game reins, spurring Seren to greater and greater speeds. You slow down by pulling your hands up to your chest and you stop completely by pulling the invisible reins over your head. It somewhat alarmingly, hilariously, feels like a Gangnam Style simulator; I heartily recommend having that song handy to play whenever you’re riding along on the open road. Good times. Magic is similarly straightforward. Pushing outward toward the screen with one hand manages your push spell and pushing with the other, your bolt spell. Aftertouch is an option in both cases. Push attaches a magical thread to the targeted object, allowing you to then toss said object or being in whichever direction you flick your hand after the spell is cast. Bolt strikes can be flicked after casting as well, at which point they boomerang around to zero in on enemies hiding behind cover. 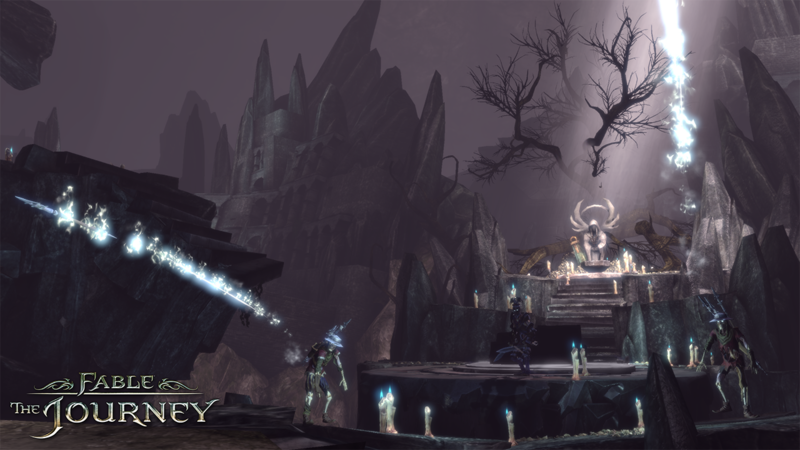 Your repertoire grows over time too, with more spells being added as you reach critical story points. Push and bolt are always your base spells, with special hand motions activating fire bolt and the spells that follow it. Alternatively — and I came to prefer this method — you can simply say the name of the alternate spell you want to cast out loud as you’re taking aim and then watch as the bolt in your hand switches to whatever effect you called for. On top of all of this you also possess the ability to block and deflect enemy projectiles by throwing your arm across your chest. The magic system works reasonably well when your Kinect is cooperating. If you thrust your hand out in the general direction of where the thing that you want to attack is on the screen, you’ll usually hit it. Unfortunately, this sort of pinpoint accuracy is the sort of thing that Kinect tends to stumble with, and Fable: The Journey is no exception. Even blocking maneuvers are frequently misread, a shortfall which results in too-frequent visits to the game over screen. When everything is working properly, on the other hand, you really start to scratch at the real potential the Kinect offers. The motion camera can read a variety of movements simultaneously, so you can block with one hand while you’re casting bolt and applying aftertouch with another, only to then immediately jump to a push spell to knock back the enemy who had been rushing toward you. It’s chaotic and exciting, and at its best moments, thoroughly immersive. You feel like a badass wizard, with the illusion only breaking when the Kinect suddenly stops cooperating and every bolt you fire lands in the dirt in front of you. Fable: The Journey attempts to keep players on the hook and invested in their horse with the dangling carrot of an upgrade system. You slowly fill up an onscreen meter to unlock upgrade tokens, with each “level” amounting to a binary choice between upgrade paths. Do you want improved Health or a more capable Horse? Better Gauntlets? Boosted Push? Bolt? It’s a simple arrangement, but your improving abilities do have a noticeable effect on your game, whether its Seren not perishing as quickly or you whittling down enemy health bars with greater speed. There are other RPG trappings as well in the way the world unfolds before you. 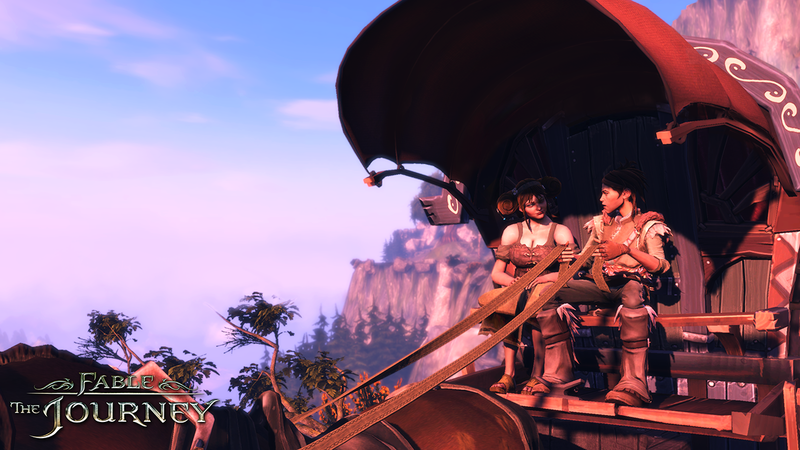 Fable: The Journey is 100-percent a rail-based game, but there’s some flexibility on those rails to make choice, notably during the carriage sequences. Random stops along the way amount to sidequests with treasure chest rewards waiting at the end. Branching pathways along the road offer different driving challenges and an assortment of XP-boosting orbs to collect, some of which can only be picked up if you’re traveling at a certain speed. There’s also some cross-game linkage with the XBLA game Fable Heroes, though it should be noted that I wasn’t able to get any gold to carry over from the other game during the pre-release period. In the realm of technical hiccups, I also frequently ran into freezes that would go on for multiple minutes, only occurring when the game would try to access saved data on the hard drive (and even then, not always). Even after playing through Fable: The Journey, I’m still very much on the fence with regards to my feelings toward the game. I think it’s the strongest story in the Fable lore, with its streamlined, even simplified, narrative delivery far eclipsing the frequently complex and bloated tales told in the previous games. What’s more, when The Journey is working right, it really is a lot of fun, perhaps more fun to play than any other Kinect game I’ve encountered. The flipside is that it really doesn’t work a lot of the time, and you’ll glare at your Kinect over an unfair death just as frequently as you cackle over pulling off some mighty feat of spellcasting. Fable: The Journey is a game for the real fans then, an adventure through Albion for those who know the world well. It will frustrate frequently, and may even drive you to shut down the Xbox and take a mellowing walk, but it’s a worthwhile ride that, at least some of the time, perfectly captures the potential of the Kinect. It may only threaten greatness, but it’s worth all of those frustration whenever those threats manage to ring true.